If there is a dessert South Africa is known for, it's their Melktert or Milk Tart. This is a tart that has as many variations to make as there is people who make them. My friend Susan made this dessert for the South African wine dinner I hosted this past weekend and it was a hit. With very common ingredients involved, anyone can make this dessert. The only thing that needs baking is the crust, which can be substituted with any favorite pie crust recipe (even if you must use one out of a tube or box). But with only 5 ingredients needed for the crust, I encourage you to try making the crust from scratch. As for the filling, it's made with milk to create a custard on the stovetop. Once the custard is made, it's poured into the baked pie crust and chilled to set. Easy peasy! Susan made both a traditional 10 inch tart (or pie) and also these mini tarts. Either way you make it, its easy to do and delicious. These tarts remind me of buttermilk pie without the tang of buttermilk. But to describe it even more, the cinnamon used to garnish the top of the tart makes it taste like a creamy snickerdoodle tart. If a snickerdoodle cookie were made into a tart or pie, this is what it would taste like! Cream the margarine and sugar together and beat in the egg. Add the flour and salt and knead until a soft dough is formed. Press the mixture into a greased circular pie dish and bake at 350°F for 15 minutes. In the meantime, Bring the milk and margarine to the boil. Cream the sugar, eggs, corn starch, flour and vanilla essence. Add some of the hot milk to the creamed mixture, then pour it back into the pot and heat gently until it thickens. Do not boil. Pour the filling into the pie crust and cool. Refrigerate the Milk Tart until required and sprinkle with cinnamon to serve. WHOOHOO!!! Nothing like melktert. Im a South African living in Cape Town and we have it regularly....those mini tarts came out beautifully. Well done to Susan. These look awesome! I was just wondering, though,, do you remember roughly how much salt is used? The recipe just says "salt". This looks great and I have bookmarked it. I am wondering why the margarine? I will be making it with butter...know any reason for the margarine? Hi Amy, I believe margarine was used so that the dough won't spread when it bakes. Give it a try with butter but I know that margarine was used in this recipe and came out perfect! There is more to this than meets the eye. 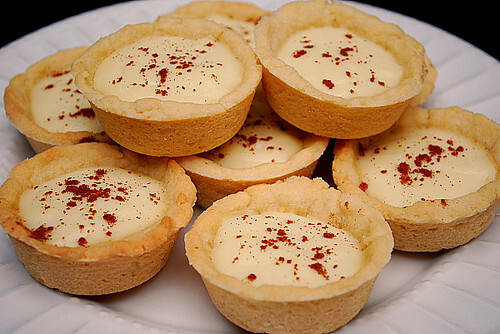 The mini milk tarts would not look like this if the crust wasn't pre-baked. Pity the entire method isn't shared here. The crust for those clearly was cut after it was rolled out and cut with a cookie cutter. ??????? yummy, definitely going to try these! After all, this will be the internet, and yes it's being taken very seriously.